CAPE CANAVERAL, Fla — Officials from NASA’s Kennedy Space Center rolled out the newly renovated Crawler Transporter 2 (CT-2) on Monday, Feb. 23, 2015. The 6.5-million-pound CT-2 will carry a 10.3-million-pound mobile launcher with the 4.4-million-pound Space Launch System (SLS) booster (without liquid propellants), resulting in a massive, 21.2-million-pound vehicle lumbering along to the launch pad at Launch Complex 39B. For more than two years, NASA’s CT-2 has been undergoing a major overhal in the Kennedy Space Center’s Vehicle Assembly Building (VAB). 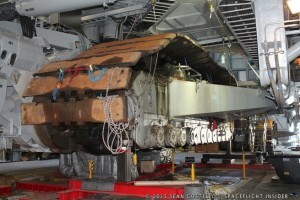 Recent work has included preparations to install upgraded components that will enable the crawler to carry the greater loads anticipated with the agency’s new rocket designed to take astronauts beyond low-Earth orbit (LEO) for the first time since the early 1970s. The renovations were supported by NASA’s Test and Operations Support Contract by Jacobs Technology Inc., NASA’s Engineering Support Contract by QinetiQ Inc., both at Kennedy, as well as Mammoet Inc. of Houston, and L&H Industrial Inc. of Gillette, Wyo. Technicians from Jacobs performed the work of removing the crawler treads prior to Mammoet jacking and cribbing the corners. L&H then removed the old roller bearing assemblies and inspected the structure and integrity of openings. 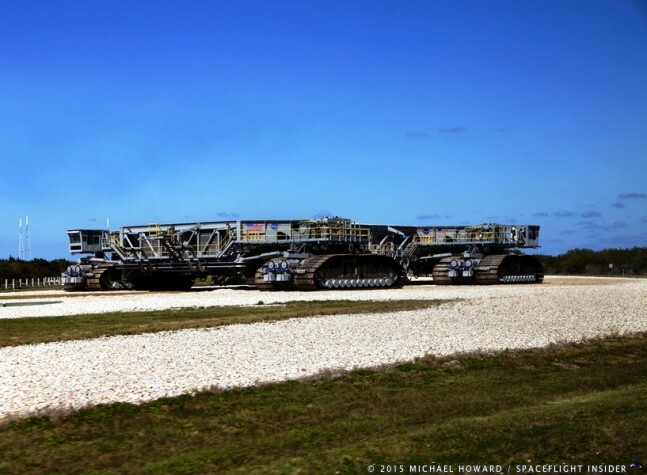 NASA has used the crawler since the 60s during the Apollo Program where the massive Saturn V booster would trundle atop the machines out to Launch Complex 39 where the rocket was used to send crews to the Moon. After decades of use, the crawlers have encountered their fair share of wear. Future modifications to extend the lifetime of CT-2’s systems include upgrades to the jacking, equalization and leveling cylinders. This will increase their load-carrying capacity and reliability. Other work completed includes replacement of electronics, cables, tubing, hydraulic components, as well as cleaning of fuel tanks and hydraulic systems. If everything goes according to plan, the crawler-transporters will deliver the first SLS to LC-39B in 2018, where it will conduct its first test flight. During this mission, dubbed Exploration Mission 1 or “EM-1,” SLS will ferry NASA’s new crew-rated Orion spacecraft on a journey around the Moon. This is in preparation for missions to an asteroid and, one day, the planet Mars.